Rioting is no giggling matter. I’ve always thought AV was a funny guy. A little dry wit at appropriate times, usually at the expense of local media but still, while he maintained that stoneface for many of his early Canucks years, this year in particular he’s really lightened up. I don’t think I need to remind any Canucks fans of his uncontrollable giggle-fits as Vernon Fiddler did his best Kevin Bieksa impression. Seems it doesn’t take much to give Coach V an attack of the funnies. 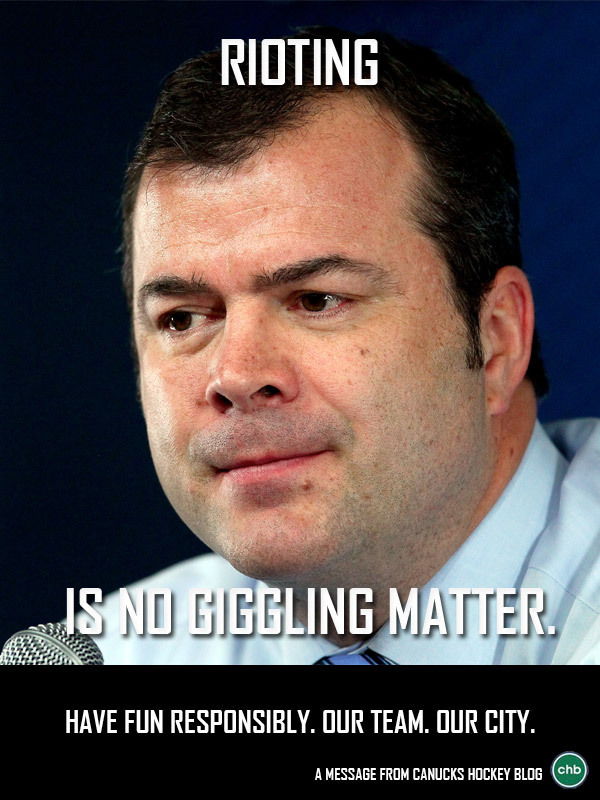 On the other hand, AV does not find wrecking Vancouver very funny…so don’t do it or he’ll bag skate you til next playoffs.